It’s another Avignon-inspired recipe for you today! Going back to Les Halles market – the one to give you foodie dreams for years to come – I mentioned the boulanger who sold apple pie by the slice. His pie/tart was not the usually fancy affair with neatly sliced apples delicately arranged in concentric circles but a handheld, picnic-friendly pud. 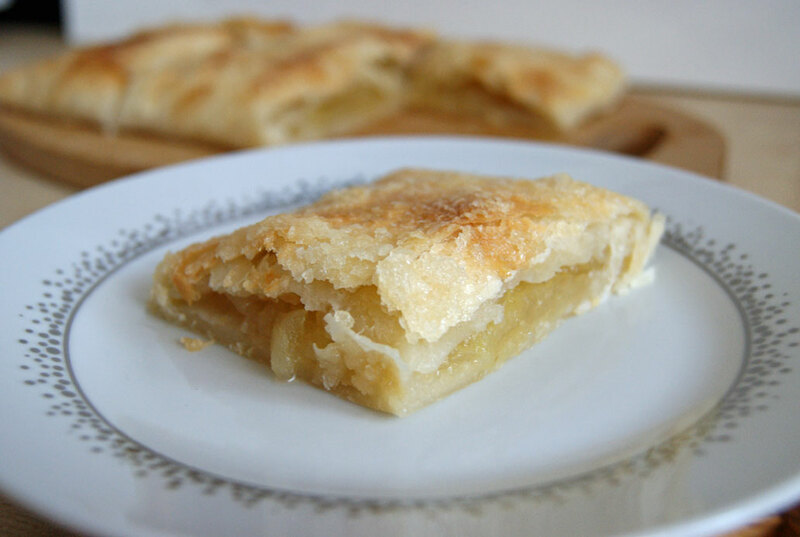 A sweet apple compote was sandwiched between two layers of flakey, buttery puff pastry while the top was covered in a crackly layer of golden sugar. 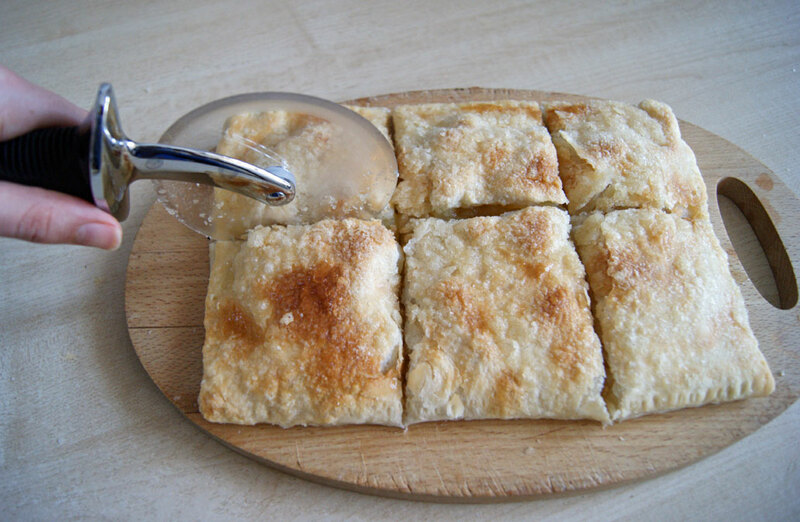 Thin squares of pie were sliced up and wrapped in a napkin for eating on the spot. The perfect end to a simple lunch of cheese, bread and tomatoes eaten on a sunny park bench overlooking the Rhone river. You couldn’t ask for a simpler recipe to recreate at home which is why it didn’t take very long for me to try out my own version. 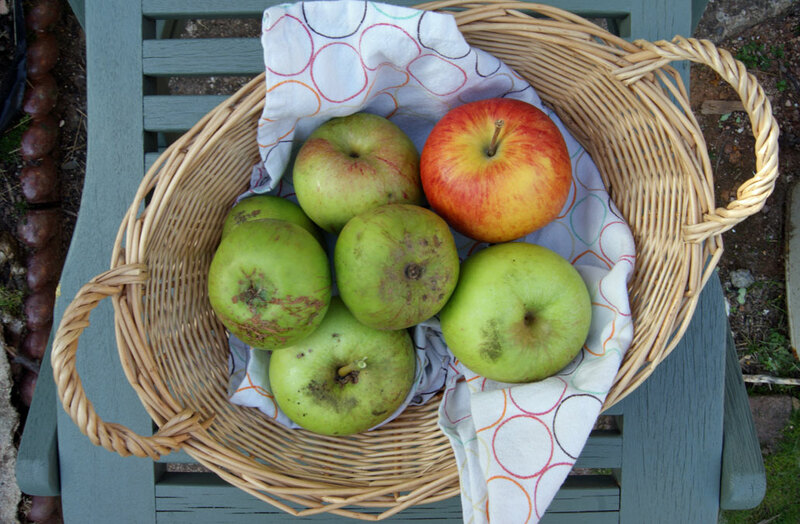 It’s also perfectly timed to make the most of the windfall apples we’re starting to gather. I’m not afraid to admit to using store-bought puff pastry, it’s ever so good and saves a lot of time and effort making this a recipe you can whip up on a weeknight for pudding or tomorrow’s packed lunch. You can cut your slices as big or small as you fancy, the portions at the market were pretty large (a good 15cm square); I cut mine a little smaller for snack-sized treats. The important thing is to make sure there’s some edge on every slice so the apple filling doesn’t slide out when you take a bite. Slice the apples and place in a medium pan with a tablespoon of water. Cook over a medium heat, stirring occasionally for 5–10 minutes until the apples break down and become fluffy. Stir in the sugar, vanilla and brandy and leave to cool. Place the pastry on a lined baking tray. Spoon the apple filling onto the right hand half of the pastry leaving a 2cm gap around the edges. Brush the edges with a little butter and fold the left-hand side of the pastry over the filling. Pinch the edges then press down on them with the tines of a fork to ensure a good seal and make a nice pattern. Brush the top of the pastry with the remaining butter and sprinkle with 2 tbsp sugar. Cut a small slit in the top to allow steam to escape and bake in the centre of the oven for 30 minutes until golden and crisp. If the sugar on top browns too quickly cover with foil and remove for the last few minutes to ensure the top is crisp. Remove from the oven and allow too cool on a rack. Slice into 6 portions, each with some edge. Wow, that was quick! You can’t beat apple pie whatever the shape. Now I know what to try baking this weekend – thank you!